WKU’s special recognition ceremonies included the ceremonial conferral of degrees to 1,418 graduates – 11 doctoral, 255 master’s, 967 bachelor’s and 67 associate degrees as well as 79 undergraduate and 39 graduate certificates; remarks from college deans; recognition of scholars; and commissioning of WKU ROTC cadets. The graduates also were individually recognized and shook hands with President Timothy C. Caboni. More: View photos from the ceremonies on WKU’s Facebook page. 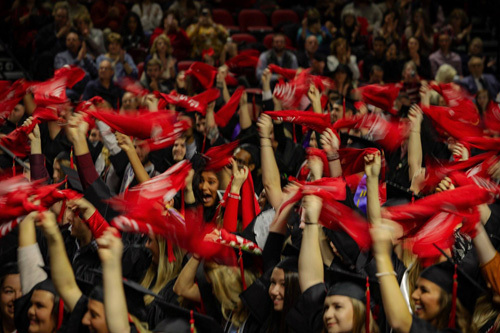 The fall graduates are encouraged to participate in Topper Walk on as part of WKU’s 185th Commencement ceremony on May 10. Emilie Gill, an Art History and Visual Studies double major from Allensville, was recognized as the Ogden Foundation Scholar during the Potter College of Arts & Letters ceremony. WKU’s top undergraduate academic award is presented to one graduating baccalaureate degree senior who has demonstrated exceptional academic achievement and outstanding university and civic engagement. Gill, the daughter of Tyler and Sylvia Gill of Allensville, is a graduate of The Mahurin Honors College, had a 4.0 grade-point average, participated in four study abroad trips to New Zealand, Austria and Ireland; attended a workshop at the Atlanta Center for Puppetry Arts; designed props and puppets for the Phoenix Theatre in Bowling Green; interned at Mammoth Cave National Park; and volunteered with the Governor’s School for the Arts. Her awards and scholarships include the Art Department’s Schierferdecker/Lester Award, the Jarve Endowment Scholarship for study abroad in New Zealand, WKU’s 1906 Founders Scholarship and the Potter College Outstanding Student Award in Visual Studies. Her work also was selected as the official logo for WKU’s International Year of Cuba. Gill thanked the Ogden Foundation Board of Trustees and the Ogden Foundation Scholar Award selection committee for the award. “It is a privilege to be selected among so many qualified students and friends, and I am deeply honored and humbled to receive this award,” she said. Gill also was recognized as one of 14 Scholars of the College, the baccalaureate degree students in each undergraduate college with the highest cumulative overall grade point average and a minimum of 60 semester hours earned in residence, were recognized at each ceremony. ROTC commissioning: Commissioned as second lieutenants were (name, hometown, first duty assignment): Hunter Harned of Elizabethtown, assigned to Fort Jackson, South Carolina; and Michael Keefer of Adairville, assigned to Army National Guard in Paducah. Scholars of the College: Rachel Pearson of Bowling Green, an Economics major and daughter of Andrea and Chris Pearson; Elissa Rose Wyne of Brooklyn, Michigan, a double major in Management and Marketing and daughter of Aimee and Randy Wyne. Scholars of the College: Emilie Gill of Allensville, a dual degree recipient with majors in Art History and Visual Studies, graduate of The Mahurin Honors College and daughter of Sylvia and Tyler Gill; Carroll Sandman of Louisville, a dual degree recipient with majors in Graphic Design and Spanish, graduate of The Mahurin Honors College and daughter of Gia and Tim Sandman. Scholars of the College: Carlos Chavez of Shepherdsville, a Construction Management major and son of Blanca and Carlos Chavez; Lindsey Howe of Reynolds Station, a Biology major, graduate of The Mahurin Honors College and daughter of Jennifer and William Howe. Educational Leadership Doctoral Program: The graduates of the Doctor of Education (Ed.D.) in Educational Leadership are (name/residence/dissertation title): Saeed Khalifa Essa Bin Harmash Almansoori of Irvine, California, From the Desert to the City: The Innovative Leadership of Sheikh Mohammed Bin Rashid Al Maktoum, Vice President And Prime Minister of the United Arab Emirates (UAE) and Ruler of the Emirate of Dubai; Donna Crouch of Mayfield, Factors That Influence Students’ Decisions to Either Drop Out or Graduate From High School in a Western Kentucky School District; Savannah A. Denning of Franklin, The Role of Leadership in School Innovation: A Case Study; Melanie Jan Duvall of Bowling Green, Determining First Year College Students’ Capacity for Active Engagement in Their Own Learning; Joetta H. Kelly of Murray, Finding Hope in Chaos: The Development of a Tool to Identify Key Factors College Students Use to Effectively Deal with Adversity; Harry Adam Nuse II of Bowling Green, Factors that Affect the Relationship Between Employer and Employees Within Organizations; Shannon M. Sales of Bowling Green, Internal and External Factors on Women Leaders’ Perceptions of Empowerment; Michael Elijah Wilson of Burkesville, Evaluating the Kentucky Association of Extension 4-H Agents Annual Conference Using the RE-AIM Framework. Doctor of Psychology in Applied Psychology: The graduate of the Doctor of Psychology (Psy.D.) in Applied Psychology is (name, residence, dissertation title): Christopher Glenn Chandler of Bowling Green, Parent Perception of the Working Alliance, Parent Self-Efficacy, and Parent Locus of Control as Predictors for Child Therapy Outcomes. ROTC commissioning: Commissioned as second lieutenants was (name, hometown, first duty assignment): Quintis Lee of Henderson, assigned to Army Reserves in St. Charles, Missouri. Scholars of the College: Devin Booty of Cloverport, an Elementary Education major, daughter of Brenda and Kevin Owens and spouse of Luke Booty; Hayley Clayton of Louisville, an Elementary Education major, graduate of The Mahurin Honors College and daughter of Gayle and Joe Clayton; Noah Edmonson of Dallas, Texas, an Organizational Leadership major, graduate of The Mahurin Honors College and son of Barb and Dan Edmonson. Doctor of Nursing Practice: The graduates of the Doctor of Nursing Practice are (name, residence, project title): Brooke A. Padgett of Vine Grove, Nurse Practitioners’ Knowledge and Screening for Adverse Childhood Experiences; and Renee Boone White of New Haven, Certified Nursing Assistants: Perceptions of Employment in Long-Term Care. ROTC commissioning: Commissioned as second lieutenants was (name, hometown, first duty assignment): Byron Nesbitt of Nashville, Tennessee, College of Health and Human Services, assigned to Army National Guard in Bowling Green. Scholars of the College: Madison Alvis of Olmstead, an Exercise Science major and daughter of Stephanie and Daniel Alvis; Aubrianna Clark of Madisonville, a Fashion Merchandising major and daughter of Rhonda Deese and Brent Clark; Kelsey Coleman of Russellville, a Recreation Administration major and daughter of Alison and Mark Coleman; Andrew Hally of Georgetown, a Family and Consumer Sciences major, son of Linda and Ed Hally and spouse of Samantha Hally; Sarah Rueff of Louisville, a Family and Consumer Sciences major, daughter of Sandy and John Rueff and spouse of Nick Smith.